Many women find that they are suffering from more severe and frequent allergies as they hit menopause. This is because hormones become unbalanced at this life stage, and, since hormones have a huge effect upon the immune system, your body can become more susceptible to allergic reactions. 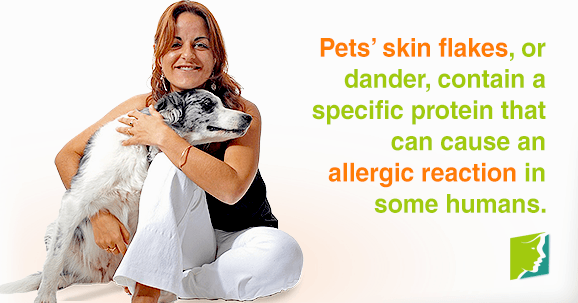 Many people believe that it is the animal's fur that causes them to have an allergic reaction to pets. Some people even believe that shorter haired breeds that do not shed their fur are preferable to longer haired breeds that do shed in order to prevent allergies from flaring up. Actually, it is not the fur of animals that causes allergic reactions, but rather their skin secretions, and, to a lesser extent, their saliva, and urine. Pets' skin flakes, which are known as dander, contain a specific protein which causes an allergic reaction in some humans. However, these skin flakes, and saliva, can be carried by the fur of animals as well as the air, so shorter haired breeds that are less susceptible to shedding can help allergies, but there are no breeds which will completely eliminate the risk of an allergic reaction, aside from reptiles and fish. It is easy to see how this myth has managed to spring up and weaved its way into accepted common knowledge. Because of its name, it is often assumed that hay fever is a result of an allergic reaction to hay. In reality, hay is not accountable for hay fever. The thing that causes it is actually pollen. A seasonal allergy, hay fever is caused by the airborne pollen from weeds, grass, and some species of tree. It is not usually caused by flowering plants, because their pollen is large and sticky, and therefore cannot be blown through a great distance. At the first signs of an allergic reaction, many people turn to antihistamine medications to help them recover, believing that they will stop the production of histamine and thus, stop the symptoms. Antihistamines do indeed work by blocking histamines, the chemical your body produces when you have an allergic reaction. However, taking an antihistamine by itself, after the symptoms have already started, will not make much of a difference. This is because, if you are already suffering from symptoms of an allergy, then your body is already reacting to the histamines, so blocking further production will not reverse the effects. Allergic reactions can be experienced at any stage of your life, but it is common to see them worsen during menopause The best way to deal with symptoms of allergies during menopause is to separate the facts from fiction, so you know the best way to treat allergies when they do happen.